California Law, as all public/internet/research support,involving the constitutional right of the GOOD innocent parent, grandparent, is not in any way unclear. ​The right to your freedoms,liberties,per child is not in any way unclear,even if california Department Child and Family Services,herein; DCFS continue to break law(s)by ignoring your rights, per adherence of such state policy,to reunite you with your child. ext. 102. ​Leaving the Federal Court,for for the owner/founder of the nation's 1st ctr., of its kind when suing pro-se self file by DEADLINE C.P.S. THe W.O.N. POWERHOUSE WOMEN NETWORK for thos who are suing by DEADLINE cps @ pro-se level, and suing the "right way." It truly feels so good! 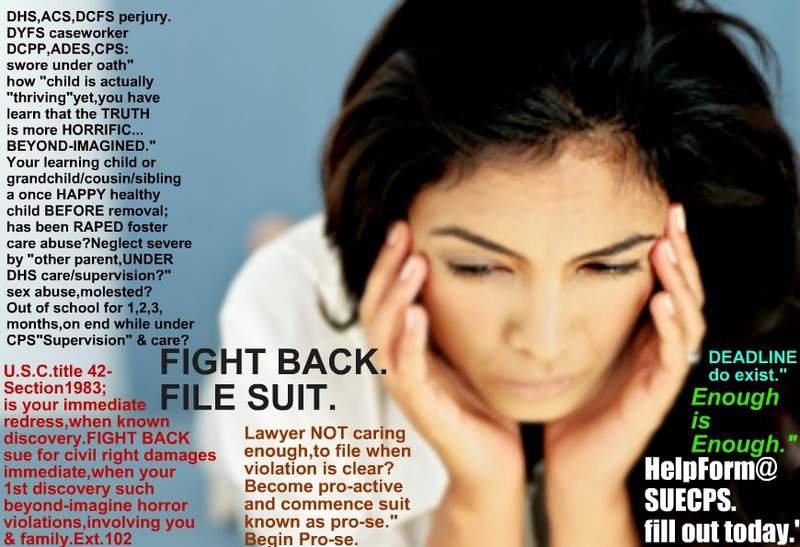 ( after being so harmed) + so violated by employees for the state, known as DCFS in Illinois to Georgia, NY,NJ,DE., CALIFORNIA Arizona nationwide. Such law degree procurement of her juris doctor in california,to east coast NYS/NJ is not too far behind, in due course after law school implementation premise on she has"been where your at. "and if your "waiting to sue"when deadline exist hoping a lawyer will"care"enough to sue for you,your going to miss per deadline that do exist,when your clearly being violated by DCFS. Remain in pain,agony,distraught,fret,anxiety-filled premise on a agency like DCFS who surely do not care how your feeling or your child,grandchild,premise on the DCFS agency has only "one clear agenda"when your child has been already remove and or is about to be seized,in violation of such child right and your own. If your not able to as most are not(google such fact) if your not able to procure"timely"a lawyer who"care"enough to file your most warranted constitutional/civil rights lawsuit,for civil right damage(s) punitive declaratory injunction; et.al be sure to become pro-active as W.O.N. NETWORK POWERHOUSE WOMEN FOUNDER/OWNER Ms.Melendez ext. 806 has publicly verified and implemented correctly. "Stand tall and firm,and get your suit in time, BEFORE DEADLINE." 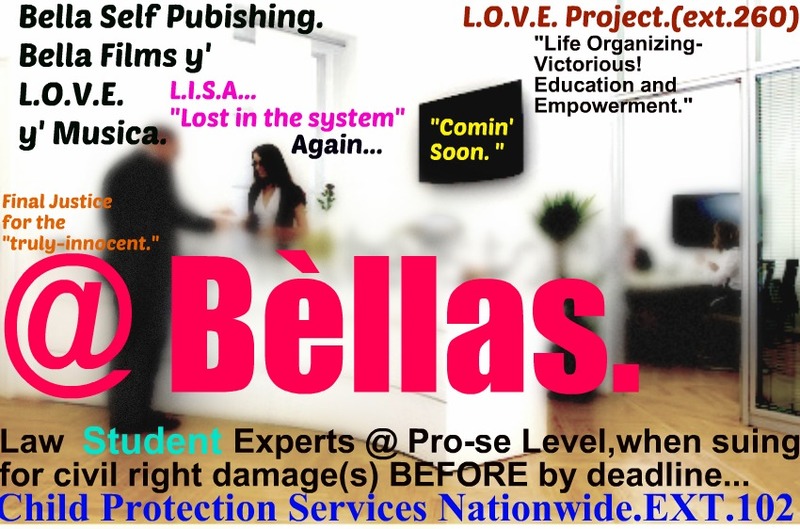 File your lawsuit as our founder.owner, Bella has successfully implemented,making headlines coast-to-coast as a astute pro-se litigant.ext. 102/260. Be sure to call-in,(after filling out,Bellas Law Expertise Student Ctr.HELP FORM) found on home page/front page,or click here to be taken immediately to our message center,to begin free call-in 1 on 1,empowerment,educational,research chat session. Time will run out to hold vile,abhorrent CPS,DCFS worker accountable if your waiting"too long to sue per DCFS social worker,employee et;al. whose clearly....violating your right. 1-929-277-7848 click HERE for e-help form,that has to be implemented." SUE CPS BY DEADLINE PRO-SE on facebook. A Nation's first of its kind effective W.O.N. 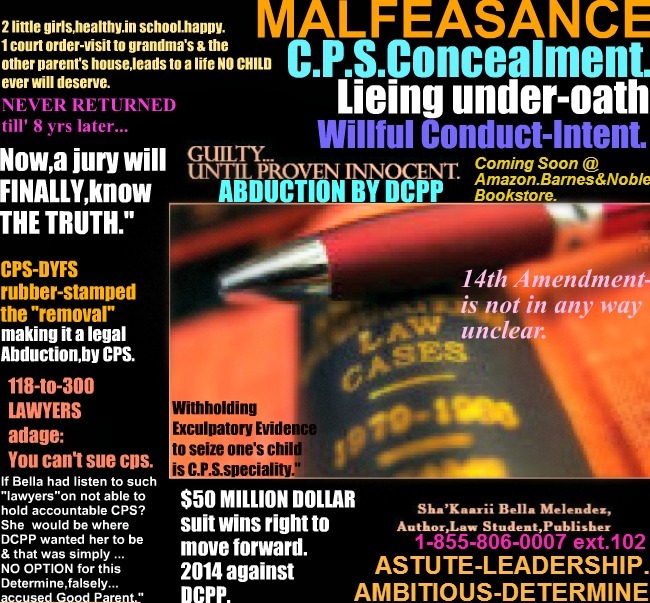 network,to continue to, streamline such extensive process when one is violated by california DCFS,and cps nationwide. .
​ San Mateo, to San Francisco, nationwide. . .